More than 25 million companies worldwide are already using Instagram for business, and more than 200 million users visit at least one business profile every day. As Facebook refocuses on connecting people with content from family and friends, Instagram has become “the new home for brands,” where engagement is high, followers are brand-loyal, and real business goals can be achieved. Here’s everything you know about how to use Instagram for business—whether you’re just getting started or you simply need to refine your existing strategy. If you already have a personal Instagram account with brand-appropriate content and an established following, you might want to simply convert it to an Instagram business account. This gives you access to all the business features but makes the transition seamless for your existing followers. You could also choose to create a brand-new Instagram business account. This is the right choice if you don’t have an existing personal account, or if your personal account does not accurately represent your business. Download the Instagram app for iOS, Android, or Windows. Enter your email address and tap Next. If you want to connect your Instagram business account to your Facebook Business Page, make sure to use an admin email address to sign up, or tap Log in with Facebook. Before you can decide what kind of content to post in Instagram, you need to think about who’s going to see it. The vast majority of Instagram users are under the age of 35, with a fairly close split between male and female users. The United States has the largest number of Instagram users, closely followed by India, Brazil, and Indonesia. That’s good information to get you started, but you need to go beyond these overall Instagram demographics to define a target audience unique to your brand. Check the analytics on your other social media channels to learn who follows you there. Create a clear value statement for your brand. Once you understand who your audience is, think about what kind of content they want to see from you. What kind of content do they post on their own accounts? How do they interact with your competitors or similar brands? Knowing what you want to accomplish by using Instagram for business is the first stage in creating an effective Instagram strategy. Understanding your goals keeps you on track and allows you to focus all of your efforts on achieving real business objectives. The exact metrics to measure and track will vary for each business. But, broadly, you should focus on metrics related to the social funnel. Awareness: Includes metrics like brand awareness, follower growth rate, and post reach. Engagement: Includes metrics like engagement rate (based on likes) and amplification rate (based on shares). Conversion: In addition to conversion rate, this includes metrics like click-through rate and bounce rate. If you’re using paid ads, conversion metrics also include cost per click and CPM. Customer: These metrics are based on actions customers take, like providing testimonials. Once you start building a following on Instagram, your fans will expect to see posts from you on a regular basis. You want to keep them aware of your brand and engaged with your content without overwhelming them to the point that they tune out—or worse, unfollow. There’s no one time that’s best to post for all businesses. 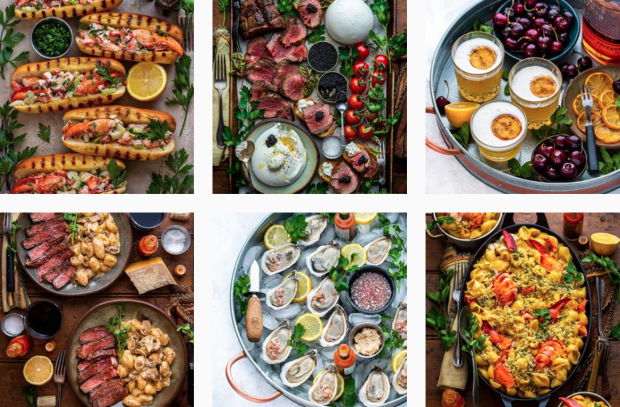 After analyzing 1,000 Hootsuite Instagram posts, the Hootsuite social marketing team found that the best time to post was 12 p.m. to 1 p.m. on weekdays, since followers were scrolling through Instagram on their lunch breaks. That’s what works for Hootsuite. It’s not necessarily what will work for you. You’ll need to do some testing to determine what times seem to create the most engagement for your post (more on that later). The key factor is to understand when your audience is online. Remember that they may not be in the same time zone as you are. 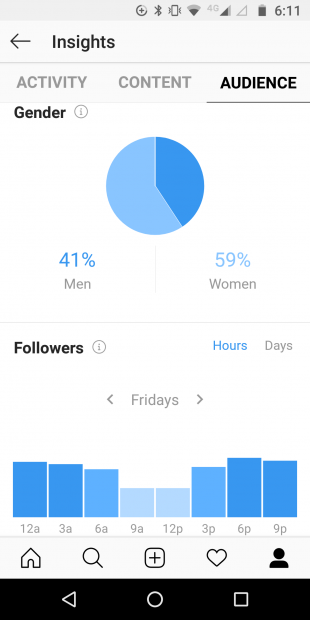 Instagram Insights shows you exactly when your followers are online, broken down by day. To access this information, go to your Instagram business profile, click the three bars icon in the top right, then click Insights. Click on the Audience tab and scroll down to see active times. Once you determine your best time to post, create a content calendar to plan and schedule your Instagram content in advance. Your Instagram bio is only 150 characters long, but it needs to do a lot of heavy lifting. It tells first-time visitors who you are, what your brand is all about, and why they should care. Use your brand voice: Convey your personality. Go casual, or professional, or a little bit cheeky, depending on what makes the sense for your business. Include hashtags: Instagram bio hashtags are clickable, and are a great way to show off user-generated content. Try emoji: These little symbols can help you convey a lot of information in just one character. Use spacing and line breaks: Line breaks make your bio easier to read online. For most businesses, the best profile pic is some version of your logo. Use the same picture you use on other social profiles to help people instantly identify your brand. Your profile photo displays as 110 x 110 pixels, but it’s stored at 320 x 320 pixels. That means it’s a good idea to upload a photo at least 320 pixels square to ensure you’re ready if Instagram changes how profile photos are displayed. Your profile pic is cropped into a photo on the app, so make sure your logo is fully visible in this shape. Use all the components of your Instagram business account to their full advantage. Name and username: These are the only parts of your Instagram profile that are included in Instagram search, so use them wisely. Include your real brand name as well as any variations (like a common abbreviation). Using the same username (or handle) on all social networks makes it easier for fans to find you. Website: This is the only spot on Instagram where you can post an organic clickable link, so be sure to include one! Link to your website, your latest blog post, a current campaign, or a special Instagram landing page. Comme Deux uses all of the available business profile options for the Instagram business account. Their physical address is shown, the category is indicated as Health/Beauty, and they have a Shop call-to-action button. Instagram is all about the visuals, so it’s important to have a recognizable visual identity. First, think about what you will showcase in your posts. In some cases, the content will be obvious: a clothing line might showcase its clothes, and a restaurant might post photos of its food. If you offer services, try showcasing customer stories (maybe gathered through a branded hashtag). Or go behind the scenes to highlight office life or introduce fans to the people who make your company tick. Once you decide on a content theme, go for a consistent visual look. That means consistent colors and filters and an overall aesthetic that is easy to spot as your fans scroll through their Instagram feed. Chef and author Dennis Prescott has a visual style that’s instantly recognizable, and they get an incredible engagement rate. With less than half a million followers, he routinely racks up 10,000 to 20,000 likes and hundreds of comments on his posts. To make Instagram work for your business, you’ve simply got to have great photos. But you don’t need to be a professional photographer, and you don’t need a lot of equipment. Use natural light. No one looks great with a flash lighting up the oiliest parts of their face and casting weird shadows on their nose and chin. The same is true for product shots. Natural light just makes shadows softer, colors richer, and photos nicer to look at. Avoid harsh light. Late afternoon is an unbeatable time to take photos. Cloudy days are better than sunny ones for mid-day shooting. Use the rule of thirds. Your phone camera has a grid built in to help you follow this rule. Place your subject where the grid lines meet to create an interesting photo that’s off center but still balanced. Try different angles. Crouch down, stand on a chair–do whatever it takes to get the most interesting version of your shot (as long as its safe to do so, of course). No matter how great your photos are, you’ll likely want to edit them before posting to Instagram. Consistent editing is one way to maintain your brand aesthetic and make your images recognizable. Mobile photo editing apps like VSCOcam or Enhance provide additional filters or editing options to help you find your unique style. You can import photos that you edit or filter elsewhere into Instagram to post them on your feed. More than 400 million people use Instagram Stories every day, and 39 percent of people surveyed said they became more interested in a product or band after seeing it on Stories. In fact, a third of the most viewed Instagram Stories are posted by businesses. Content that disappears after 24 hours and live broadcasting features make Instagram Stories the perfect place to take creative risks with attention-grabbing photos and videos. How can you make the most of Instagram Stories? Not surprisingly, this aptly name feature is a great platform for storytelling. Tell authentic brand stories that have a beginning, a middle, and an end. Get creative with Stories slideshows and provide real value for your viewers to get them in the habit of watching your Stories consistently. End your Stories with a powerful call-to-action to convert your Stories views into measurable business successes. Need some inspiration? Check out some great examples of brands using Instagram Stories effectively. Want to extend the life of your Instagram Stories content beyond 24 hours? You can do that with Instagram Stories Highlights. Instagram may a visual platform, but that doesn’t mean you an neglect your captions. Captions allow you to tell the story that makes the photo meaningful. Captions can make your followers think, laugh, and feel a connection to your brand. Mr. Pokee the hedgehog is cute and all, but the captions that accompany his photos give the account personality and and make fans want to stop and engage. „Dear Santa, I’ve been good all year no matter what the evidence may suggest. – xoxo Pokee“ ???????????????? To create compelling captions, you need to develop a clear brand voice. The most important thing is to be consistent. Do you use emoji in your captions? Are there grammatical guidelines your brand follows? What hashtags do you use? A good set of style guidelines will help keep your captions distinct and on-brand. For tons of great Instagram caption examples, and tools that will help you make your own captions even better, check out our post on how to write Instagram captions for business. Social networks are all about community. A community relevant to your brand already exists on Instagram. You just have to find them. One way to do that is to engage with people and brands they already follow. Start by monitoring industry hashtags and commenting on appropriate Instagram posts. Follow the people who participate in these discussions. This is a simple way to make your presence known to people who are likely to be interested in your content. Hashtags help make your Instagram content easier to find. Captions on Instagram are not searchable, but hashtags are. When someone clicks on or searches for a hashtag, they see all the associated content. It’s a great way to get your content in front of people who don’t already follow you. You might want to consider creating your own branded hashtag. A branded hashtag embodies your brand and encourages followers to share photos that fit that image. It can be a great source of user-generated content and encourage community among your fans. Amsterdam Marketing uses the #iamsterdam hashtag to collect user-generated content, which they reshare to promote a colorful and visitor-created feed of the city. Want to know more? Check out our full guide on how to use hashtags on Instagram. Remember: this is social marketing. You can’t neglect the social aspect. That means responding to comments and mentions of your brand on Instagram, so users feel motivated to keep engaging with your brand. You might be tempted to automate your engagement using bots. Don’t do it. We tried it, and it doesn’t work out so well. Dedicate some time to responding authentically when someone mentions or tags your brand. Influencer marketing is a powerful way of gaining access to an engaged and loyal Instagram following by working with an Influencer whose fans might be interested in your brand. Even small brands with limited budgets can use influencer marketing by working with micro-influencers: people with a smaller but dedicated following. For real-world insights on how to best work with Instagram influencers to grow your Instagram business following, check out our insider tips in this post from influencer Lee Vosburgh, creator of the 10×10 Style Challenge. If you’ve got an established following on other social networks, let those people know about your Instagram business account. Make sure to tell them what kind of content you’ll share on your Insta profile, so they know why it’s worth their time to follow you in more than one place. Include your Instagram handle in your email signature, and don’t forget about print materials like business cards, flyers, and event signage. Instagram can provide great organic business results, but it’s also worth investing in Instagram ads to ensure you get your content in front of a wider (but very targeted) audience. In addition to extending the reach of your content, Instagram ads include call-to-action buttons that allow users to take action straight from Instagram, reducing the number of steps required to get them to your website or promotion. Get all the details on how to use Instagram ads for your business in our detailed blog post on that topic. An Instagram campaign can help you achieve a specific goal more quickly than you could by simply following your overall Instagram business marketing strategy. Campaigns can involve ads, but they’re not only about paid content. They involve intense focus on a specific goal for a set period of time, in both your organic and paid posts. We walk you through all of the details in our post on creating successful Instagram marketing campaigns, but here are some potential campaign ideas to get you started. Run an awareness campaign to increase your overall visibility on Instagram. Promote a sale using shoppable Instagram posts. Once you’re using Instagram to promote your business, you need to check in regularly to see how your progress matches up to your business goals. You’ll want to track the results of individual posts, ads, and stories, as well as your Instagram business account as a whole. There are a lot of numbers to keep an eye on, but there are plenty of analytics tools to help you keep it all sorted. We’ve got the details in our post on the 7 best analytics tools when using Instagram for business. One of the best ways to consistently improve your results is to test each new strategy to see how it performs. As you learn what works best for your specific audience, refine your strategy. Create two variations based what your research tells you. Keep the two versions the same except for the one element you want to test. Track and analyze the results of each post. Test another small variation to see if you can improve your results further. Share what you learn throughout your organization to build a library of best practices for your brand. Learn more in our post on social media A/B testing. And there you have it—now you’re ready to craft your own strategy and put it into action. Good luck. The post How to Use Instagram for Business: A Simple 6-Step Guide appeared first on Hootsuite Social Media Management.